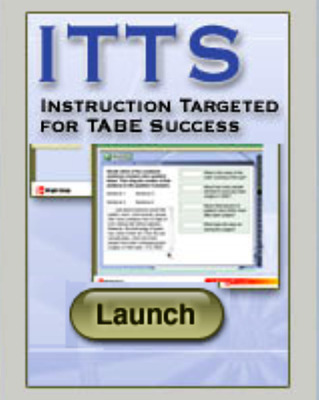 Instruction Targeted for TABE® Success (ITTS)* delivers a high-quality, in-depth curriculum in a digital format that features targeted instruction and focused practice. Through direct correlations to the skills and content outlined by the National Reporting System (NRS), it clearly guides students and instructors toward the kinds of measurable gains that create true college and career readiness and support your program’s success. *The same content is available in print format. See Achieving TABE® Success. GED®, GED TESTING SERVICE®, and GED PLUS® are registered trademarks owned by American Council on Education (“ACE”). This [book/material/content] is not endorsed or approved by ACE or the GED Testing Service LLC. TASC Test Assessing Secondary Completion is a trademark of McGraw-Hill School Education Holdings, LLC. All rights reserved. McGraw-Hill Education is not affiliated with The After-School Corporation, which is known as TASC. The After-School Corporation has no affiliation with the Test Assessing Secondary Completion (“TASC test”) offered by McGraw-Hill Education, and has not authorized, sponsored or otherwise approved of any of McGraw-Hill Education’s products and services, including the TASC test. HiSET™ (High School Equivalency Test) is a trademark of Educational Testing Service (ETS). Through direct correlations to the skills and content outlined by the National Reporting System (NRS), this program clearly guides adult learners and instructors toward the kinds of measurable gains that create true college and career readiness and support your program’s success.